Resilience is the preservation of communities through ongoing planning for the capacity to learn, adapt, and change in the face of present-day and future threats, both predictable and unknown. When we are talking about resilience in the built environment, we are actually talking about communities, not buildings. 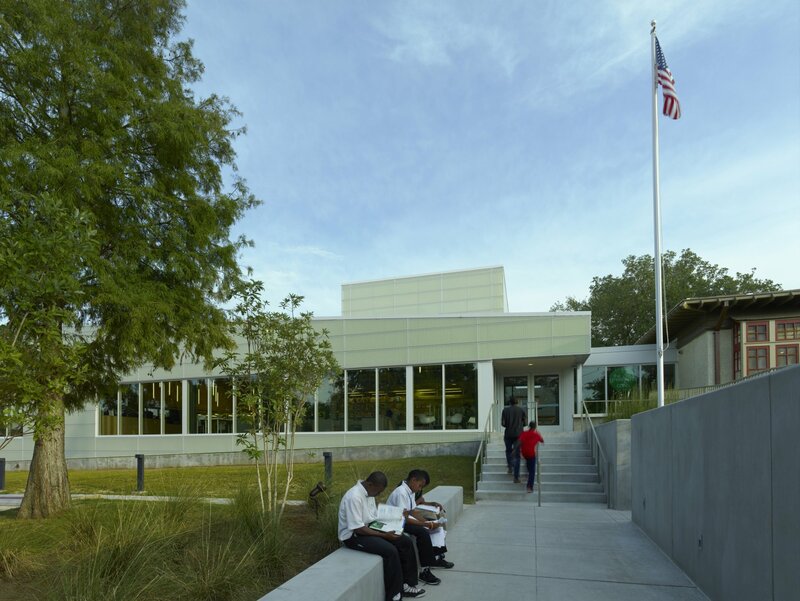 Buildings may endure or survive a disturbance, but it is communities that “come back.” While promoting resilience does indeed involve building strong or building flexibly, it also means building in ways that are attentive to how communities repair themselves and adapt to changing or unexpected circumstance. Community connections, networks and relationships are the cornerstones of community strength. Historians and scientists who study how communities come back from disasters have produced literature showing that communities able to organize themselves around common goals respond and recover more rapidly from environmental traumas. Resilient design makes this far easier. 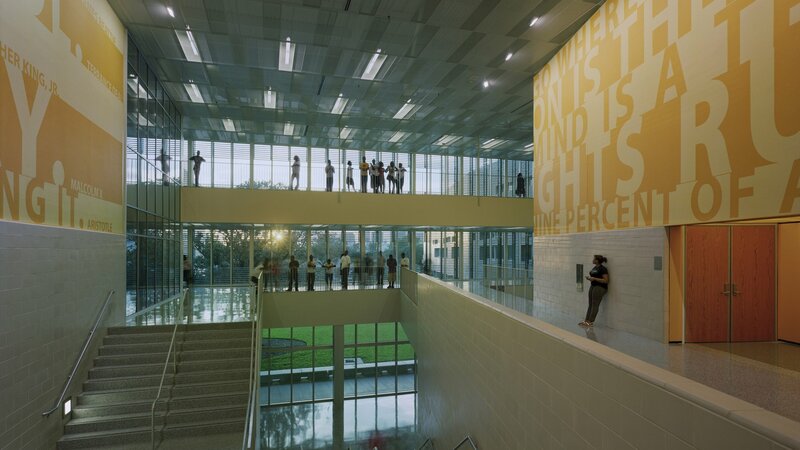 Landry B. Walker High School, a post-Katrina replacement high school for the Louisiana Department of Education’s Recovery School District. As we have become more deliberate about resilient design in our work, certain themes recur—each manifesting themselves at multiple scales. To deal with these topics, we found it useful to break questions of resilience into themes or components at different scales. We call this approach the Resiliency Framework. 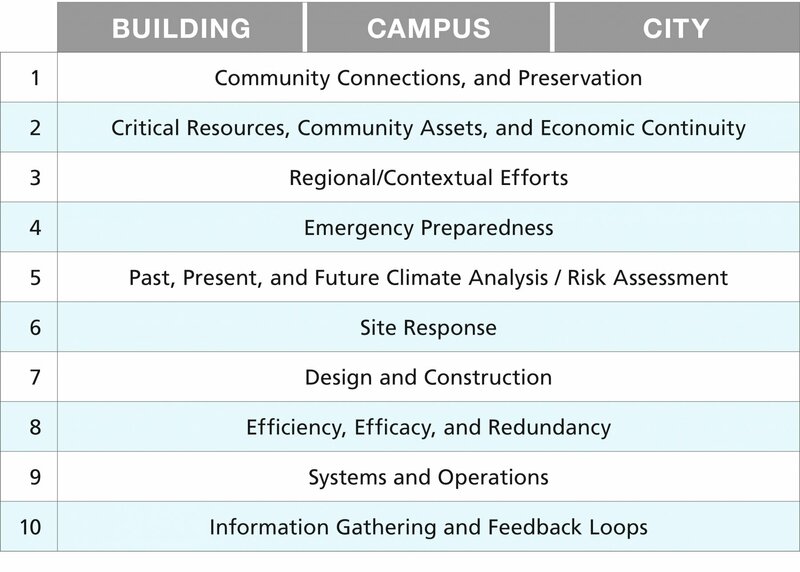 It breaks explorations of resiliency into ten components, each asking different kinds of questions, and then looks at resiliency at the three scales at which design and planning professionals typically work: the individual building, the district (whether campus or neighborhood), and the city. Each component may require that we consider sudden events and slow changes in the environment over a time scale of years to decades and beyond. Unfortunately, in an era where “100 year storms” are hitting every decade, we cannot base our planning on historical data alone — we have to look forward.